Buon giorno and welcome to Stefano’s RomeCabs, Rome’s leading company for private Airport and Civitavecchia Transfers, Day Tours from Rome, and Shore Excursions from Italy’s top cruise ports. We have provided transfers from Rome’s main airports for more than 15 years and counting, serving tens of thousands of travelers and cruisers arriving in Rome on their holiday. We compiled a list of 7 things to know before booking Rome airport transfers based on our extended experience, and questions we’ve received from thousands of clients over the years. 1 Vehicles have eight passenger maximum. The maximum size vehicles that can access Rome’s historic center is 8 passenger vans. Vehicles larger than 8 passengers fall into the bus category and are not granted access into the heart of Rome where most of travelers book their accommodation during their stay in Rome. This is also the largest size vehicle permitted to access Civitavecchia Cruise Port (for cruisers who book transfers from Airport to their cruise ship in Civitavecchia). If you are traveling in a group larger than 8 persons, you would require 2 vehicles together. Most vehicles for transfers in the Rome range from sedans, SUVs, and most common minivans of up to 8 passengers. If you are a party of 1 to 3 passengers with extra luggage make sure you inform the company so you will not be provided a sedan priced for 1, 2 or 3 passengers. If you are a bigger group of up to 8 Persons with extra luggage also inform the transfer company to make sure all your luggage can fit in a van as you may require 2 vehicles for extra luggage. FCO Airport has a meeting point area where all drivers are required to wait in main waiting hall after passenger clear customs and exit the baggage claims area. Drivers are not permitted to greet their clients in customs or by the carousels in baggage claims as those are security restricted areas and only ticket holders and individuals with special airport security clearance may enter. The Meeting Point area is easy to find, it’s an area in the main waiting hall of Terminal 1 and Terminal 3 marked by multiple large columns. You will see MANY drivers there holding signs with their clients names… it may make finding yours a bit difficult when there are dozens of drivers side by side and one behind the other, so look carefully or call the company providing the transfer to assist you in locating your driver. Designated parking for a car service vehicles is a few minutes walk from FCO airport terminal. The area where drivers are permitted to park is NOT a choice, but mandated by the Airport Security. Vehicles are not permitted to park elsewhere or pick up passengers curbside. ALL travelers who book private driver services are obliged to walk to the designated parking area… there are no other options due to security measures. For travelers with mobility issues, FCO Airport offers Complimentary Wheelchair Assistance that travelers may book in advance via their Airline Company. When wheelchair assistance is booked in advance, an airport staff member will meet the passengers at their plane, and accompany them with the wheelchair all the way to the parked vehicle. Many small streets and alleys in the historic center of Rome may be restricted to traffic. If you require door to door service (be dropped off at the entrance of your hotel or alternate accommodation), be sure to select a hotel or accommodation on a street that allows traffic and vehicles to stop and unload passengers at their door. Otherwise, drivers will park as close as lawfully possible, and meet the clients on foot at their hotel or accommodation and accompany them with their luggage to the parked vehicle. Driving time between FCO airport and central Rome is up to 40 to 60 minutes pending local traffic conditions. It’s best to allow plenty of time to arrive at the airport in case you may encounter any unforeseen delays on the way to the airport. 6 Traveling with young children? Children 8 years and younger are required by law to be secured in their own age appropriate safety seats inside moving vehicles. Children cannot be seated in other passengers laps. If you are traveling with young children and do not plan to bring your own child seats with you, be sure to request age appropriate child seats or booster seats from the company you book your transfers with. Arriving at the airport early in the morning but can’t check into your hotel or apartment until afternoon? 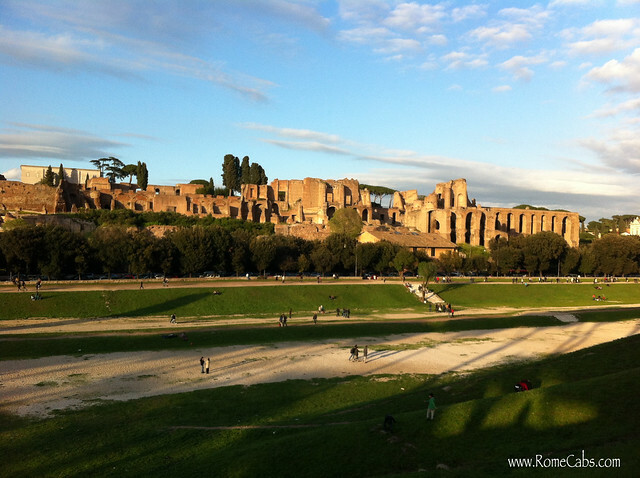 In Rome for a limited time and wish to make the most of it? 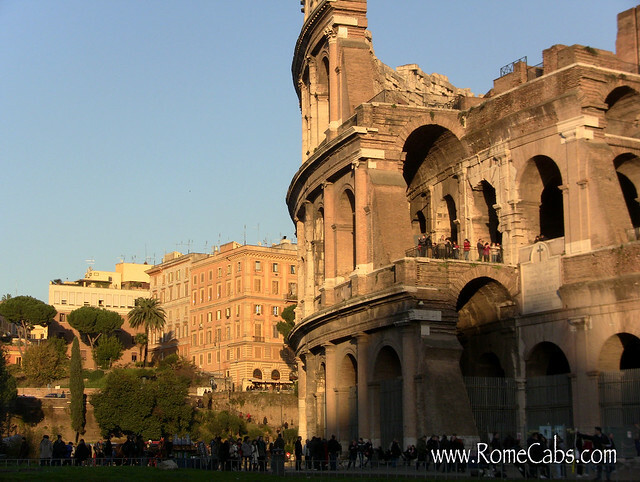 Wish to maximize your sightseeing opportunities in Rome? You may book a tour of Rome straight from the airport. Your English speaking tour driver will meet you at the airport for your arrival, and then whisk you off on a fun fill day exploring Rome. Your tour will end with your hotel drop off. You may book a short 1 Hour or 2 Hour tour by car from the airport, or a longer 4 Hour or even a full day tour of Rome starting from the airport. Visit our website for more information, or contact us for a customized extended tour of Rome from the airport. Buon giorno and welcome to Stefano’s RomeCabs Transfer and Tour blog. We are at your service to turn your Italy cruise and trip into a vacation of a lifetime with our private tours and transfers. Civitavecchia is one of the most significant cruise ports in Italy and it serves Rome and its environs. Most of the cruises start and end in Civitavecchia. Since most cruisers who arrive in Civitavecchia Pre Cruise either come from Rome hotel or airport pre-cruise, they have the opportunity to turn their Civitavecchia Transfer into a Sightseeing Tour by including a half day journey into the charming Roman countryside which is also conveniently located near Civitavecchia. At the end of your tour you and your luggage will be delivered conveniently on the pier next to your ship so you can quickly embark on your cruise. If you will be staying in Rome prior to your cruise, you will be picked up in the morning by Stefano’s Rome Cabs English speaking Driver and enjoy a relaxing drive out of Rome and into the quiet countryside. If your flight arrives early in the morning before 9 AM, you too can make the most of your pre cruise time in Italy to enjoy the Countryside. Just about 1 hour from Fiumicino Airport on the highway, the Roman countryside is an ideal pre cruise tour as you will be traveling in the direction of Civitavecchia making the most of your limited time. Enjoy the Photo and Video Gallery below of what to expect to see and do on your Countryside Pre Cruise Tour with Stefano’s RomeCabs. Lake Bracciano is an ancient volcanic crater that is now of the most pristine lakes in Italy. Favored by Italians seeking to escape the chaotic city life of Rome, Lake Bracciano is one of the top countryside destinations for Italians. The 15th century imposing Renaissance Castle is commonly known as Bracciano Castle (named after the town of Bracciano where it’s located). Its official name is Odescalchi-Orsini Castle, and for centuries it is still owned by the same Odeschalchi family and it’s one of the best preserved castles in Italy. You will have the wonderful opportunity to visit Bracciano Castle and explore elegant rooms still with their original Renaissance era furnishings, wall paintings, frescoes, tapestries, friezes, weaponry, and more, turning it into an actual museum. Many of Italy’s kings, queens, lords, ladies, knights and Popes and some of the most powerful families (think the Borgias!) have once lived and slept here. Depending on when you visit Bracciano Castle, you might feel as though you have the castle to yourself as you explore the grounds and the “Court of Honor” with arches, ramparts and pathways. Located on the southern shore of Lake Bracciano, it offers visitors a spectacular panoramic view of the lake and the surrounding countryside. Your encounter with Ceri will be unexpected. Through the rustic countryside roads it will suddenly appear in front of you, the remains of its ancient fortified walls rising out of the tuffa cliff. A narrow street will wind its way up through the arched village gate to the top of the hamlet’s only square. A stop light at the bottom and top of the hamlet allows traffic to pass one direction at a time as the narrow medieval passageway is only wide enough for one vehicle to drive through at a time. Historic buildings with aged sun kissed facades and a church surround the tiny square. If not for all the vehicles parked there, you’d swear you’ve traveled back in time and found yourself in a Medieval borgo. From as far back as the Etruscans, then the Romans, followed by the Middle Ages and the Renaissance Era, these ancient and distant civilizations have left their presence behind in this tiny little village. The Romanesque Sanctuary of Mary (the church in Ceri), is quite fantastic. Through simple on the outside, inside it’s an artistic masterpiece. Originally built on top of an ancient pagan temple dedicated to goddess Vesta, the Sanctuary of Mary will amaze you with an impressive 11th century cycle of frescoes from the Old Testament. These frescoes that cover an entire wall were discovered during a renovation in 1980. Not to miss in inside the Sanctuary of Mary is the side Chapel of Gratitude. If you’d like to visit the amazing places covered on this travel blog, please visit our website tour page for complete information and option to book your own Pre Cruise Countryside Tour, CLICK BELOW and experience the wonders of the Roman countryside on your way to Civitavecchia. Thank you very much for reading our Must See Countryside Wonders on your way to Civitavecchia Cruise Port blog post. We look forward to showing you beautiful places in Italy! Buon giorno and welcome to Stefano’s RomeCabs, Rome’s leading company for private transfers and tours to and from the Rome Sea Port of Civitavecchia. We have been providing Rome Sea Port Transfers and Tours (to and from Civitavecchia Cruise Port) for 15+ years, always focused on providing the most efficient, reliable, affordable and enjoyable transfers and tours to the millions of cruisers who stop at the Rome sea port in Civitavecchia. We have also written dozens of helpful travel blogs and articles that offer tips and advice to our clients and travelers in general. In this travel blog, we compiled our top travel articles that contain useful information to help cruisers plan their Civitavecchia Port Transfers and Tours. CLICK ON THE TITLES BELOW to go to each informative travel blog page. This blog offers information on baking your Rome Sea Port Civitavecchia Transfers Easy (easy hassle free pick up and drop off), Efficient (predictable and timely travel time) and Enjoyable (there’s nothing like traveling in your comfortable private deluxe vehicle driven by your personal driver). Find out how to book and how to plan your transfers to and from the Rome Sea Port of Civitavecchia. How do I book a Civitavecchia Transfer from Fiumicino FCO Airport? How far in advance should I book my Civitavecchia Transfer? Can your driver enter the port and provide pier-side pick up and drop off? Can we combine a Civitavecchia Transfer with a Tour to / from our ship? Can we share our Civitavecchia Transfers with other cruisers? Each question is answered thoroughly to help you plan your Civitavecchia Transfers, know what to expect, book correctly, and how to enhance your travel experience to and from the Rome Sea Port of Civitavecchia. Is your Cruise Ship docking in Civitavecchia and you can’t decide on which Rome shore excursion to book, or are looking for ideas and inspirations for your day in Rome? This blog lists the top 5 “Cruisers’ Choice” Rome shore excursions from Civitavecchia along with suggested itineraries, descriptions, and even videos. All the tours are offered on our website in the Civitavecchia Shore Excursions category. Are you looking to share your shore excursions but don’t want to be cramped in a van full of complete strangers who may or may not have the same interests as you, or may cause you to not enjoy your tour at all? We have the PERFECT solution for you: Your Own Privately Shared Shore Excursion. Find out why thousands of cruisers choose to be in charge of creating their own small group tours with fellow like minded cruisers for a far superior tour experience where you save money and make new friends! This travel article offers you 10 TIPS on Tour sharing for your best Italy shore excursions! how far in advance to book your Civitavecchia Transfers? is it recommended to book last minute? Is it recommended to book your transfers while on your cruise? Small but important details make the difference between having a stress free Civitavecchia transfer or a stressful experience. You think it’s difficult to book your transfer from Fiumicino Airport to Civitavecchia? We make it very easy for you to book with us! In this travel article we show you 3 easy steps for convenient, hassle free, and enjoyable travel from the airport to your cruise ship. CIVITAVECCHIA TRANSFERS – HOW TO MAKE YOURS EVEN BETTER! . If you staying in Rome prior to your cruise and wish to make the most of your limited time, in this travel article we show you how to enhance your transfer from Rome to Civitavecchia with sightseeing opportunities along the way. You can enjoy seeing and visiting places in Rome you haven’t seen yet, or venture into the countryside to visit magnificent castles and medieval villages on your way to Civitavecchia. We offer you all the various pre cruise tour options with photos, videos and descriptions to help you choose the option that best suits your interests. All the pre cruise tour options discussed in the travel blog are also available to book directly on our website. Thank you for reading our Rome Sea Port – Helpful Tips, Info for Civitavecchia Transfers, Tours travel post. For more information on Rome Sea Port Transfers and Tours from Civitavecchia, please visit our website in the banner below. Our dedicated team is always happy to help!